Frank Dunlop. “Frank Dunlop colour Allan Warren” by Allan warren – Own work. Licensed under CC BY-SA 3.0 via Wikimedia Commons. The Young Vic was the brainchild of Frank Dunlop, who in the late 1960s was Administrative Director with the National Theatre Company then at the Old Vic. 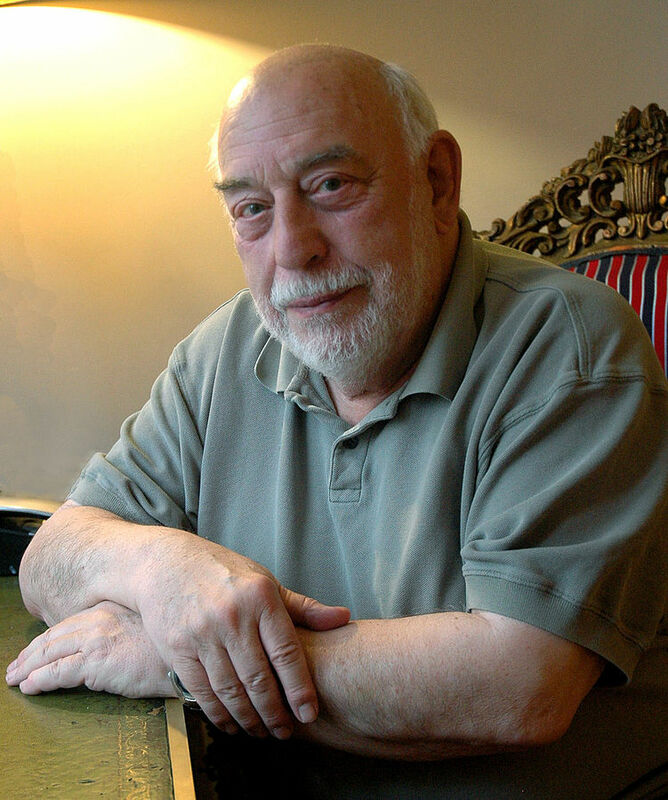 He had started his career as director of a young theatre company in Manchester, and subsequently his productions exhibited a liveliness appreciated by youngsters. Dunlop’s concept was to provide a venue where the young people of south London could come to appreciate theatre through the presentation of live plays from the Classics to the modern masters. These were aimed at teenagers and those in their early 20s, but there were to be activities in which younger children could take part. The Arts Council gave a grant based on a 5 year rent of an existing theatre, but Dunlop decided to use the money in creating an entirely new venue. A bomb site was obtained from the GLC at 66 The Cut. At the extremely low cost of £60,000, the architectural firm of Howell, Killick, Partridge and Amis built, within the space a year, a square structure using concrete breeze blocks and external steel framework, incorporating the relics of a David Greig’s butcher’s shop as its foyer. The roof of the auditorium hung from a single steel girder. What it lacked in external aesthetics, the new theatre was well equipped with a versatile interior. The stage projected from the rear wall and the seats ranged round three or all four sides in an octagonal arrangement. It seated 350 downstairs and another 100 in the balcony. It was the first custom-built theatre for young people. The productions were to play in repertory, and tickets for all the seats were 7/6 (38p) for plays and 10/- (50p) for musicals. The theatre was officially opened by Sybil Thorndike on 12th August 1970. And the first production opened a month later on September 11th. It was “The Cheats of Scapino”, an adaptation of a Moliere play by Dunlop in modern dress, borrowing from pantomime and music hall. It starred Jim Dale in the leading role. The audience was greeted by an ear-splitting rock group in the foyer; fireworks signalled the start of the performance and at the finish everyone participated in imitating a band of street musicians. “Oedipus” joined the repertoire a week later. The theatre also invited other leading young companies from the U .K. and abroad: the first was a group of Americans from Texas who presented a multi-media rock musical “Stopp” on September 15th, and then from the U.K. came the Freehold with Webster’s “The Duchess of Malfi” on October 6th. The Young Vic became independent from the National Theatre three years later, quickly building up a reputation in its own right. Michael Bagdanov worked with the Young Vic for two years from April 1978. He subsequently founded the Young Vic Education and Community Services. The Young Vic provided a venue for the Royal Shakespeare Company and the Ballet Rambert. Fringe groups have also visited, and foreign companies, notably Peter Brook’s Paris production of “Ubu Roi”. In recent years the appeal of this theatre has attracted more mature audiences. Big names have appeared such as Venessa Redgrave, Helen Mirren and Ian McKellen, and top directors and designers have worked there. In 1990, the Arts Council cut its grant to the Young Vic drastically, placing this vital theatre in dire circumstances. In September 1991 it held a 21st Birthday Celebration and fundraising weekend. This is an article from our archive and has not been updated.